Lent and Easter are relatively late this year. Four Lenten study evenings are taking place in the Rectory at 8 p.m. on Thursdays in Lent. In March, the study evenings looked at the Apostles’ Creed and the Nicene Creed. There are two further evenings in April: Thursday 4 April, the Athanasian Creed; Thursday 11 April, the 39 Articles. These evenings are open to all parishioners and friends. Tea/coffee are provided at each of these study evenings, which last for about an hour. The scaffolding that covered the west front of Saint Mary’s Church, Askeaton, has come down and this stage of securing the church façade has been completed successfully. 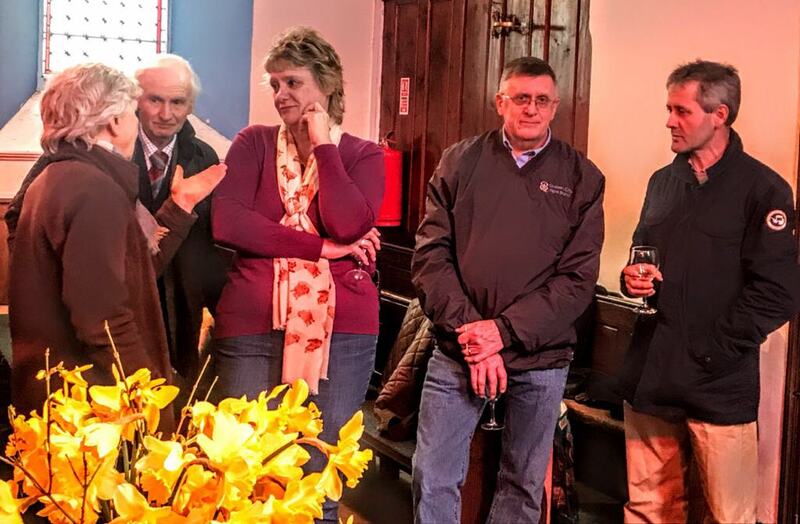 At a reception in the church Sunday afternoon, Simon White explained the work involved and what has been achieved. Many thanks to Simon and Hilary White, Bill Conroy, Leo Sullivan, Ralph and Ann Drew, Donagh O’Grady, Sabastian Billioud, Charlie Slagle, Brian Fitzell, Richard Langford, Tom Carew, Moran’s Shop, Peter McGarry, and the many parishioners, friends and neighbours who helped with this work, and to Ann Drew, Kaye Griffin and Betty Cregan who worked hard to bring the church interior back to pristine condition. Limerick City and County Council has approved €3000 funding for railing at Holy Trinity Church, Rathkeale, under the current Community Employment Scheme. Thank you to Councillor Adam Teskey for his role in securing this funding. 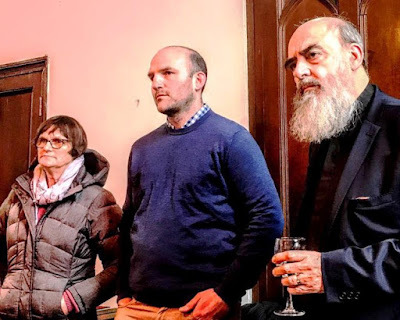 The Revd Anne-Marie Stuart, FJ, of the Kilcolman Union of Parishes lead two workshops for clergy and readers on ‘The Adventure of Prayer’ and ‘Faith Development’ in the Rectory in Askeaton, on 4 March. The next workshops take place in Askeaton Rectory on Monday 13 May. Sunday 7 April (Lent 5): 9.30, Parish Eucharist (Holy Communion 2), Saint Mary’s Church, Askeaton; 11.30, Morning Prayer, Saint Brendan’s Church, Kilnaughtin (Tarbert). Sunday 14 April (Palm Sunday, Lent 6): 9.30, The Parish Eucharist (Holy Communion 2), Castletown Church; 11.30, Morning Prayer, Holy Trinity Church, Rathkeale. Monday 15 April: 8 p.m., Evening Prayer, Saint Mary’s Church, Askeaton. Tuesday 16 April: 8 p.m., Late Evening Office, Saint Brendan’s Church, Kilnaughtin. Wednesday 17 April: 8 p.m., Compline, Holy Trinity, Rathkeale. Thursday 18 April (Maundy Thursday): 8 p.m., the Maundy Eucharist, with Washing of the Feet, Castletown Church. Friday 19 April (Good Friday): 12 noon to 3 p.m.: The Three Hours, Christ’s journey with the Cross to Calvary, Saint Mary’s Church, Askeaton. 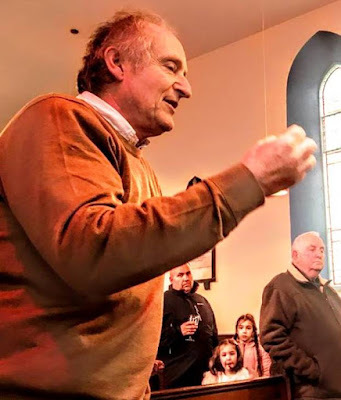 Saturday 20 April (Easter Eve): 8 p.m., The Easter Eucharist (Holy Communion 2), Holy Trinity, Rathkeale; 10 p.m., The Easter Eucharist (Holy Communion 2), Castletown Church. Sunday 21 April (Easter Day): 9.30 a.m., the Easter Eucharist (Holy Communion 2), Saint Mary’s Church, Askeaton; 11.30 a.m., the Easter Eucharist (Holy Communion 2), Saint Brendan’s Church, Kilnaughtin (Tarbert). Sunday 28 April (Easter 1): 9.30: Morning Prayer, Castletown Church; the Parish Eucharist (Holy Communion 2), Holy Trinity Church, Rathkeale (with the Revd Joe Hardy). This is an edited version of the parish notes for the Rathkeale and Kilnaughtin Group of Parishes in the April 2019 edition of ‘Newslink,’ the magazine of the Church of Ireland United Diocese of Limerick, Killaloe and Ardfert (pp 27-28).